Watsonville, CA -- The “How To” guides on entering the many and varied divisions at the Santa Cruz County Fair remain available on line at the Fair’s website. “We are working closely with the Monterey County Fair, which runs just a week before us, and making it possible to enter both Fairs” said Emily Grunewald, the fair’s exhibit representative. Exhibitors may check a box on their qualifying Monterey County Fair entry and it will be transported automatically to the Santa Cruz County Fair. Be sure to check the instructions listed in the Monterey County Fair Entry Guide. Whether experienced old hand or first time entrant, the Entry Guide and companion Horse Show Guide answer questions, provide forms, list drop off locations, and deadlines. 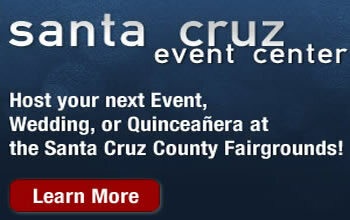 The complete Exhibitor’s and Horse Show Guides can be accessed on line at www.santacruzcountyfair.com. In addition the printed guide can be found at local libraries and the Fair office located on East Lake Avenue (Highway 152) in Watsonville. The divisions open for exhibit entries range from Amateur Winemaking to Poetry, Sewing, Pies and Cakes and home grown Fruits and Vegetables plus dozens more including livestock, poultry and rabbits. A separate Horse Show Entry Guide is also available either on line or the usual locations. Exhibit questions should be directed to the fair office by calling 831-724-5671. The entry deadline for most categories is Saturday, August 7, 2010 and a few weeks later on Saturday, August 21, 2010 for the Horse Show.